Another part of preparation for the southern African regional bloc to take command of the African Standby Force (ASF) was recently completed in Botswana in a first for the Southern African Development Community (SADC). Exercise Pabalelo lasted two weeks and saw seven SADC countries send elements of their military health services to Maun. The aim of the exercise was, according to an SADC document, “to test the SADC Standby Force’s medical battalion capability”. The exercise was conducted under the theme of “Fortified and comprehensive health: A precursor to military success and victory in combat” and marked the first co-operative training effort by the regional bloc in the sphere of military health. Combat medical support during peace support operations and humanitarian assistance missions was a major focus of the exercise which also saw extensive work done on validating the draft SADC military health services doctrine and to practice command, control, communications and co-ordinating structures in the provision of medical support. Host country Botswana was joined by Lesotho, Malawi, Mozambique, Namibia, South Africa and Zimbabwe for Pabalelo which also saw inter-operability given a high priority. Strengthening operational readiness of the regional standby force was another priority. This saw Level I medical support stations in Kareng, Tsau, Phatlhane and Bodibeng, Level II medical support stations in Sehithwa and a Level III medical support station at Letsholathebe II Hospital in Maun, also the final referral level. In January – now about four weeks away – SADC will lead the ASF roster for six months and is expected to provide a rapid deployment capability toward peace support efforts across the entire continent, if needed. During the exercise 160 different medical procedures were performed on civilians. This was done to alleviate surgical backlogs in areas such as cataracts, Caesarean sections and hysterectomies. Pabalelo participants also took part in outreach programmes as part of the exercise’s civil/military co-operation which saw indoor residual spraying for malaria and canine vaccinations for rabies. 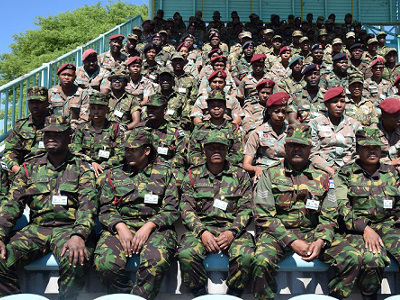 Pabalelo, along with the regional bloc’s command post exercise Umodzi, Special Forces exercise Matumbawe and the military aviation exercise Blue Kunene, were all preparation for the ASF duty. Speaking at the end of the exercise, Botswana Defence Force (BDF) deputy commander Major General Gotsileene Morake noted contemporary and future security environments on the African continent will be “significantly characterised” by epidemics and challenges to healthcare services in conflict zones.